LODGE A RETURN DELIVERY OPTIONS TROUBLE RETURNING? - Are accompanied by a copy of your invoice or proof of purchase. Please note NZ boutiques, Myer and David Jones Concessions are unable to accept returns for purchases made online. Click and collect orders must be returned to a standalone store or outlet store only. 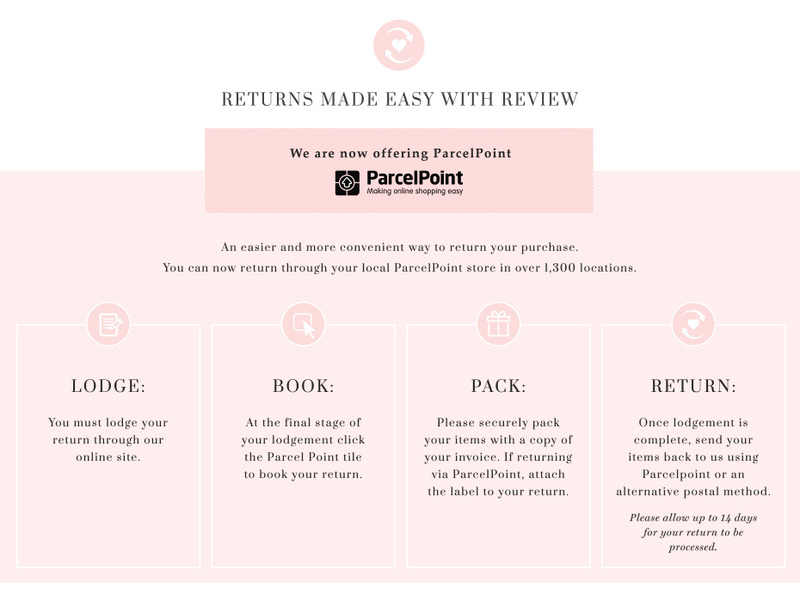 If you would like to exchange your online purchase you can do this at any Review Boutique only. Please make sure you have a copy of your receipt and take your purchase back to any Boutique store within 30 days of receiving your purchase. To find your closest Boutique store, please click Locations and filter by store type: Boutique. Online orders cannot be exchanged through the online store, if returned by post your order will be refunded. These are Review online terms & conditions only and may be different from our in-store terms & conditions. As monogrammed items are bespoke please note we cannot accept exchanges or refunds. This does not affect your rights under the Australian Consumer Law regarding faulty items. Please visit the marketplace you purchased from and make sure you follow the returns process listed on the marketplace.